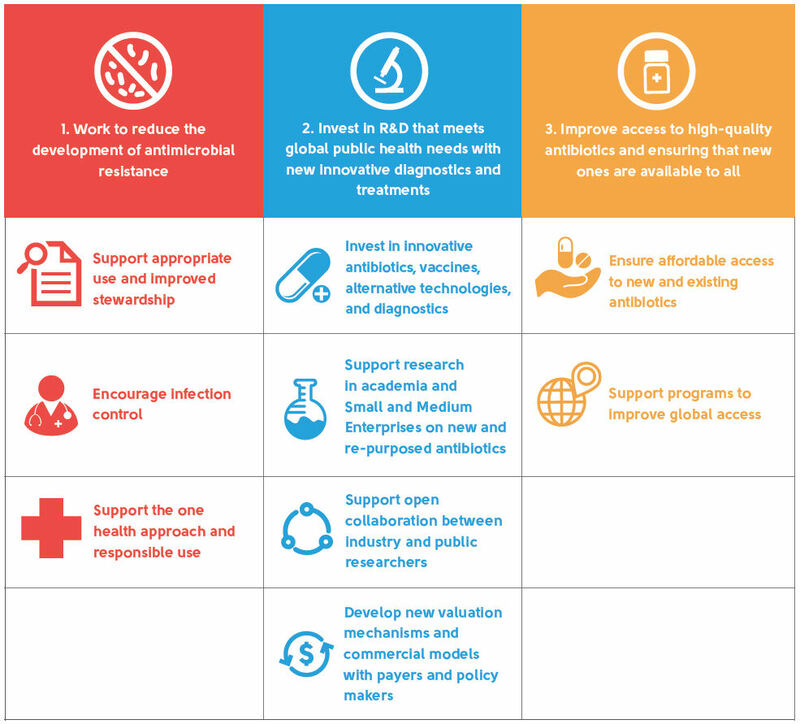 In the Declaration, signatories call on governments to work with them to develop new and alternative market structures that provide more dependable and sustainable market models for antibiotics. These mechanisms are needed to provide appropriate incentives (coupled with safeguards to support antibiotic conservation) for companies to invest in R&D to overcome the formidable technical and scientific challenges of antibiotic discovery and development. These include mechanisms to ensure that, where appropriate, the pricing of antibiotics more adequately reflects the benefits they bring; and novel payment models that reduce the link between the profitability of an antibiotic and the volume sold. Work to reduce the development of antimicrobial resistance. Invest in R&D that meets global public health needs with new innovative diagnostics and treatments. Improve access to high-quality antibiotics and ensuring that new ones are available to all. The Declaration remains a living document. When published in January 2016, the Declaration had been signed by 85 companies and nine industry associations from across the global pharmaceutical, diagnostics and biotechnology industries. As of 1st April 2016, a total of 98 companies and 11 industry associations in 21 countries have added their signatures to it. Join us in conversations around AMR using the hashtags #AntimicrobialResistance, #AntibioticResistance, #AMR, #SuperBugs, #IndustryOnAMR on social media.